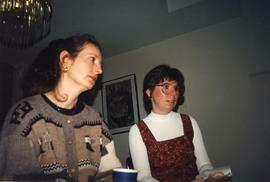 Photograph depicts two unidentified woman at Chanukah party. 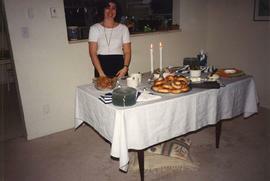 Colour photograph depicts Sharon Sheppard standing at food table at Chanukah party. Photograph depicts adults putting together crafts at a table. Photograph depicts children sitting in a circle around a woman with presents in a school room. Photograph depicts children sitting in a circle around a woman in a school room. Photograph depicts children sitting in a circle around a woman in a school room with their arms raised. Photograph depicts unidentified woman writing on a poster. Photograph depicts three unidentified women. Photograph depict a woman and three boys in costume in a school room.